The 1962 Willys ‘Jeep’ Universal CJ-6 4-Wheel Drive is nationally significant based on its association with important events and people in American history. 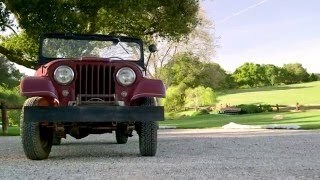 This ‘Jeep’ was the personal, recreational and utility vehicle owned and used by the 40th President of the United States of America, Ronald Wilson Reagan. Importantly, President Reagan’s ‘Jeep’ is almost entirely unrestored and is significant for its informational value as a testament to its use on the Reagan Ranch, Rancho Del Cielo near Santa Barbara, California in the Santa Ynez Mountain range.